Years after becoming a member of the General Union of Palestine Students [GUPS], Ashraf Taha, a young political activist, discovered that he should have gained membership in the PNC 18 years earlier. Finally, he did succeed in becoming a member of the PNC in its last session held in April 2018. Taha was one of the youth leaders who was an active participant in the dialogue sessions MIFTAH conducted last year and which it continued throughout this year. Representatives from factions, student bodies and youth groups also participated in addition to the various PLO departments, popular unions and university student council representatives. During the sessions, the most important amendments to GUPS’s bylaws were discussed which would guarantee fair representation for youth in the Union, determine the ages of GUPS members and members of its leadership bodies . Taha recalls these dialogue sessions and their importance, especially now that he is a PNC member. Immediately after gaining membership, Taha did not hesitate to nominate his successor, a young woman, to take his place after this session given that he is now over 40. The dialogue sessions were extremely beneficial in that they reminded the youth and the various factions of the importance of their role as youth in decision-making positions and of women assuming the status they deserve in these bodies. This was reflected in the youth document that represents the youth sector in the various factions, which is a guarantee for pumping new blood into the system and renewing its vitality and legitimacy. MIFTAH project coordinator Hassan Mahareeq commented on Taha’s statement, saying: “There have been many studies and analyses addressing the underlying reasons for the weak participation of youth in public life, including political participation. Most came up against the reality of Palestinian society, whose people are made to endure the daily measures of the Israeli occupation including ongoing arrests, closures and its direct targeting of youth”. In addition, he said, “Palestinian society is patriarchal, which means it is controlled by a traditional leadership, which wants to maintain the status quo even in light of the political division. 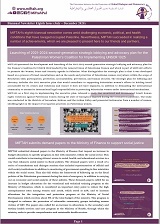 Based on this reality, MIFTAH looked for sufficient answers to these issues, through conducting an in-depth study of the institutions of the Palestinian political system, namely the PLO. It addressed the most significant hindrances within these bodies and produced solutions in a serious bid to achieve real representation for youth by reviving and reactivating these institutions,” he said. 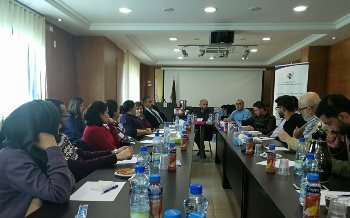 Through its meetings and discussions held throughout 2017 and through its contacts this year with all parties of interest, including representatives from political factions, student bodies and groups, PLO departments, popular unions and university student bodies, MIFTAH ensured a commitment from all factions on the need to revive GUPS. The most important amendments to the Union’s bylaws were discussed in a way that would guarantee fair representation for Palestinian youth in the West Bank and Gaza Strip, by considering each Palestinian university an individual branch of GUPS, determining the age of GUPS members and members of its leadership bodies and representation of young women of no less than 30% according to a Central Council decision. 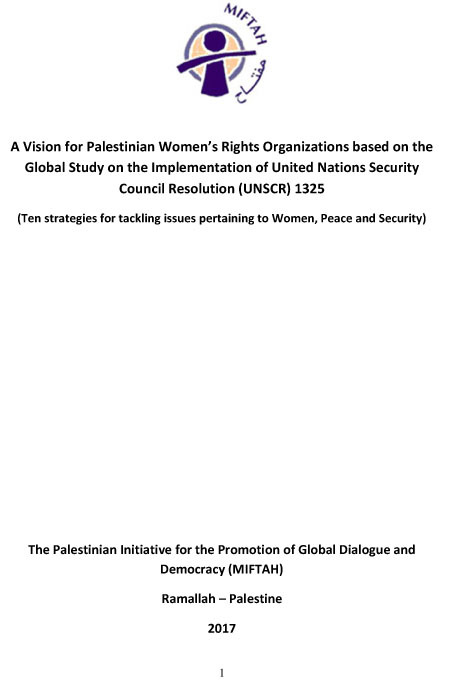 These demands were included in the public policy paper sent to the PLO’s Executive Committee as recommendations to be approved after review and discussion. The participation of student body representatives in political factions in these discussions indicated to their aspirations on the need to revive youth bodies within the Palestinian political system. Several of the youth ran for membership in the PNC in its most recent session, some of whom did gain membership as youth representatives of their factions. This was considered a success for all efforts previously made by MIFTAH and contributed to developing national efforts and directing them towards more attention to this vital issue. It had a direct impact on renewing the legitimacy of the youth component of the Palestinian political system through reviving GUPS and making it a priority for political action for youth. It should be noted that through its dialogue sessions, MIFTAH was able to rally a consensus over the political youth document, which includes the youths’ vision of a Palestinian state and the political system. This includes the foundations for citizenship and their rights and duties. The articles of the document were adopted by most Palestinian factions, student blocs, youth institutions and the Higher Council for Youth and Sports. The policy paper, which was a product of these discussions and dialogues, confirmed the document’s articles and the commitment by all parties to support youth efforts in political participation and to promote their representation at all political decision-making levels.